beautiful thorns: Time to Shear the Sheep! Time to Shear the Sheep! 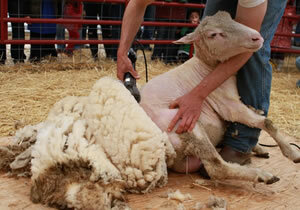 Last week in prayer, I heard the Lord say, "It is time to shear the sheep." Now, we know that Jesus is the Good Shepherd and as I pondered what that word might mean, I thought about the abundance of grace, love and blessing God's people have experienced! Many of us have stored up these graces as the Lord has been teaching us to rest in Him and grow in our relationship with him. That is a good thing! I believe however, it is now time to share what we have been given! At first this might feel uncomfortable as we are called out of our comfort zones and placed in situations requiring us to share our faith and resources. We may also feel confused as to what is going on as well as vulnerable and exposed. As we surrender to the process however, willing to be vulnerable, trusting God and allowing ourselves to be led by the Lord, others will be blessed and experience God's loving presence and warmth through us.